This article is about the street newspaper. For the French web documentary, see The Big Issue (website). "Big Issue" redirects here. 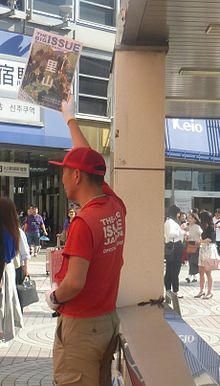 For the South Korean television series, see Big Issue (TV series). The Big Issue is a street newspaper founded by John Bird and Gordon Roddick in September 1991 and published in four continents. The Big Issue is one of the UK's leading social businesses and exists to offer homeless people, or individuals at risk of homelessness, the opportunity to earn a legitimate income, thereby helping them to reintegrate into mainstream society. It is the world's most widely circulated street newspaper. Inspired by Street News, a newspaper sold by homeless people in New York, The Big Issue was founded in 1991 by John Bird and Gordon Roddick as a response to the increasing numbers of homeless people in London; they have been friends since 1967. The Body Shop provided start-up capital to the equivalent value of $50,000. The magazine was initially published monthly; but, in June 1993, The Big Issue went weekly. The venture continued to expand with national editions being established in Scotland and Wales, as well as regional editions for Northern England and England's South West Region. Further editions are also produced in seven locations overseas. In 1995, The Big Issue Foundation was founded to offer additional support and advice to vendors around issues such as housing, health, personal finance and addiction. In 2001, the magazine sold nearly 300,000 copies per week. Between 2007 and 2011, the circulation of The Big Issue declined from 167,000 to less than 125,000. Competition between vendors also increased at this time. In January 2012, the magazine was relaunched, with an increased focus on campaigning and political journalism. New columnists were added, including the Premier League footballer Joey Barton, Rachel Johnson, Mike Shinoda of Linkin Park and Samira Ahmed. The cover price was increased. In 2016, The Big Issue celebrated surpassing 200 million magazine sales. To become a vendor, one must be homeless or almost homeless, vulnerably housed or marginalised in some way. The Big Issue recognises, however, that for many people, being housed is only the first stage in getting off the streets; therefore, The Big Issue Foundation exists to support vendors in gaining control of their lives by tackling the various issues which lead to homelessness. 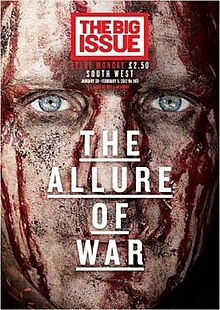 There are five localised editions of the magazine sold throughout the United Kingdom and vendors buy The Big Issue for £1.25 and sell it for £2.50. The magazine is also produced and sold in Australia, Ireland, South Korea, South Africa, Japan, Namibia, Kenya, Malawi and Taiwan. All vendors receive training, sign a code of conduct and can be identified by badges which include their photo and vendor number. Big Issue features prominently in the story of London busker James Bowen's struggles with homelessness and heroin addiction, told in his best-selling book, later turned into the feature film of the same name, A Street Cat Named Bob. After busking on the streets becomes a problem, Bowen becomes a Big Issue vendor, with partner Bob the cat helping attract sales. Bob was featured on the cover in mid-November 2018, with Bowen's article In Bob We Trust: Life lessons from Britain’s favourite streetwise street cat. The accession of several Central and Eastern European countries to the European Union in 2004 led to the increased migration to the UK of residents of those countries. When Romania and Bulgaria joined the EU in 2007, the right of their residents (termed "A2 nationals") to work in Britain was limited to the self-employed, highly skilled migrants, and food and agricultural workers. The Big Issue, whose vendors are classed as self-employed, offers an opportunity for A2 migrants to work in the UK. By 2011, around half of Big Issue sellers in the north of England were of Romani origin, many of whom having migrated from Romania and Bulgaria. In London, 30% of rough sleepers are Eastern European. In 2012, a Romanian Big Issue vendor obtained a court ruling which confirmed that she is entitled, as a self-employed person, to receive housing benefit. The Big Issue has been criticised for enabling migrants to access the benefits system in this way. The magazine responded by asserting its role in reducing benefit dependency, highlighting British Prime Minister David Cameron's description of it as 'a fantastic example of how we can reduce dependence on state hand-outs'. The magazine is produced by The Big Issue Company Ltd. The company is a self-sustaining business which generates income through magazine sales and advertising revenues. Financially, The Big Issue is a not-for-profit organisation, with all post-investment profits passed to The Big Issue Foundation (legally a separate entity). The Big Issue Foundation is the registered charity arm of the organisation. It aims to underpin the company's work by tackling the underlying causes of homelessness. There are nine Big Issue projects by the same name in other nations. The Big Issue France (from October 1993): In France, a non-profit organization named Big Issue France created with support from John Bird the magazine against exclusion called La Rue. The Big Issue has been the centre of much controversy among publishers of street newspapers, mainly because of its business model. Publishers of some other street newspapers, especially in the United States, have criticised it for being overly "commercial" and having a flashy design. According to these critics, street newspapers ought to focus on covering political and social issues that affect the homeless, rather than emulating mainstream newspapers to generate a profit. Publishers of some smaller papers, such as Making Change in Santa Monica, California, said they felt threatened when The Big Issue began to publish in their area. Other papers have also criticised The Big Issue for its professional production and limited participation by homeless individuals in writing and producing the newspaper. Others, however, have stated that The Big Issue uses a successful business model to generate a profit to benefit the homeless, and its founder John Bird has said that it is "possible to be both profitable and ethically correct". ^ "Paul McNamee". bigissue.com. Retrieved 11 September 2018. ^ "The Big Issue - National (Group)". Retrieved 11 September 2018. ^ "Contact Us". bigissue.com. Retrieved 12 September 2018. ^ "Introduction & History". Big Issue. Archived from the original on 2008-09-24. Retrieved 2008-10-11. ^ "Contact Us". bigissue.com. Retrieved 11 September 2018. ^ Heinz, Teresa L. (2004). "Street Newspapers". In David Levinson (ed.). Encyclopedia of Homelessness. SAGE Publications. p. 538. ISBN 0-7619-2751-4. ^ a b c Brown, Ann M. (2002). "Small Papers, Big Issues". Ryerson Review of Journalism. Archived from the original on September 11, 2007. Retrieved 12 February 2009. ^ Greenstreet, Rosanna (August 27, 1995). "HOW WE MET; JOHN BIRD AND GORDON RODDICK". The Independent. Retrieved June 10, 2016. ^ a b c d e Boukhari, Sophie (15 May 2001). "The press takes to the street". The UNESCO Courier. UNESCO. Archived from the original on February 20, 2008. ^ a b "The Big Issue Magazine: Help the Homeless". The Economist. 7 January 2012. Retrieved 30 January 2012. ^ "Revamped Big Issue hits the streets". BBC News. 16 January 2012. Retrieved 30 January 2012. ^ BBC (7 April 2016). "Big Issue celebrates 200 million sales". Retrieved 11 September 2018. ^ "How We Work". The Big Issue. Archived from the original on 2009-03-02. Retrieved 21 January 2012. ^ ""The Big Issue - Code of Conduct"" (PDF). Archived from the original (PDF) on 2010-07-05. Retrieved 2009-05-11. ^ "In Bob We Trust: Life lessons from Britain's favourite streetwise street cat". The Big Issue. Retrieved 2018-11-12. ^ Reid outlines new EU work curbs, BBC News, 24 October 2006. Retrieved 24 October 2006. ^ "Efforts to integrate Roma people are under threat from cuts". The Guardian. 27 April 2011. Retrieved 30 January 2012. ^ "Big Issue seller wins right to claim housing benefit". The Guardian. 17 January 2012. Retrieved 30 January 2012. ^ "Roma vendors and media criticism". The Big Issue in the North. 24 May 2011. Archived from the original on 19 September 2011. Retrieved 30 January 2012. ^ "We are leading the way in benefit dependency". The Big Issue. 18 January 2012. Retrieved 30 January 2012. ^ a b Howley, Kevin (2005). Community Media (illustrated ed.). Cambridge University Press. p. 71. ISBN 0-521-79228-2. Retrieved 2009-02-12. ^ "Ernst & Young Entrepreneur 2008 award recipients" (PDF). Ernst & Young. 2 December 2009. p. 2. Retrieved 21 October 2014. ^ "Richard Harpin, CEO of Homeserve Plc, is Ernst & Young 'UK Overall Entrepreneur Of The Year 2008'". Ernst & Young. 7 October 2008. Archived from the original on 23 February 2012. Retrieved 21 October 2014. ^ ". World Habitat Day 2006 | Previous Scroll Winners". Un-Habitat. 2013-09-26. Archived from the original on 2013-10-04. Retrieved 2013-10-02. Hanks, Sinead; Tessa Swithinbank (1999). "The Big Issue and other street papers: a response to homelessness". Environment and Urbanization. 9 (1): 149–158. doi:10.1177/095624789700900112. Swithinbank, Tessa (2001). Coming Up from the Streets: The Story of The Big Issue. Earthscan. pp. 21–33. ISBN 1-85383-544-7. Retrieved 2009-03-11. Wikimedia Commons has media related to The Big Issue.